One of Moore’s images showing immigrants crossing into Mexico from Guatemala. 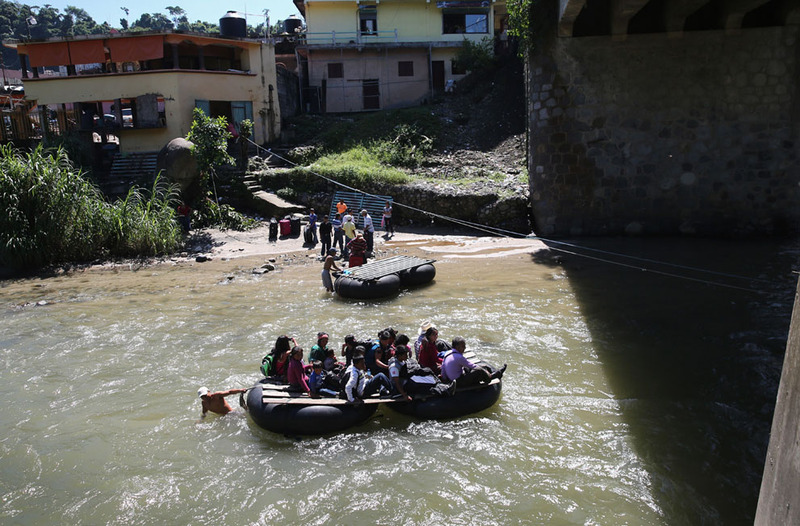 Getty Images photographer John Moore took his coverage of immigration stories a step further when he traveled to the Mexico-Guatemala border, where Central American immigrants cross the Suchiate River, beginning their long and perilous journey north through Mexico. View his images here. On my way to Tapachula to get a visa renewed, I witnessed people openly crossing the Guatemalan/Mexican border on rafts just below the bridge where immigration officers are checking documents for those who cross legally. They were going both ways. Those headed north may have been just starting their journey to attempt a border crossing into the USA. Those heading south had loads of products, gasoline, etc. that they were not-so subtly smuggling into Guatemala where untaxed gas is openly sold along the highways at nearly $1.30 (US) cheaper than the going rate at legal gas stations.